AllSaints is an iconic and distinctive British clothing brand that burst onto the fashion scene back in 1997. The flagship store launched on London’s Carnaby Street, and quickly made its way into cities across the globe. The Republic of Ireland is lucky enough to have three stores located in Dublin, Dundrum and Kildare Town. The trademark aesthetic of AllSaints plays on an edgy, unique sense of cool. It tends to go for a street style, with many of its garments made from materials in earthy, dark hues - which appeals to rock stars and gothic fans alike. The brand sells a lot of leather garments and handbags, and both its Men’s and Women’s Leather Jackets are well worth the investment if you want a statement piece that’s going to stand the test of time and look effortlessly cool all year round. If you prefer to shop online, AllSaints’ website is striped back and easy to navigate, making the whole shopping experience enjoyable from start to finish. If you’re shopping for others, grab some AllSaints Gift Cards, redeemable online or in store and presented to the recipient in a beautiful gift box. How do I use my AllSaints promotional code? Choose a code and copy it from vouchercloud. Click ‘shop now’ and wait to be redirected to the AllSaints website. Shop for your items, and go to ‘shopping bag’ when ready. Add your promotional code to the box on the right, click ‘apply’. Click ‘Proceed to checkout’ to finish your transaction. Subscribe to the newsletter to receive offers, flash sales and new product collections. Is AllSaints affiliated with Amazon Prime? Yes, if you have an Amazon Prime membership there are some benefits to shopping online with AllSaints. However, be aware that it doesn’t allow delivery to Amazon Lockers, and AllSaints gift cards cannot be redeemed when purchasing through Amazon Pay. 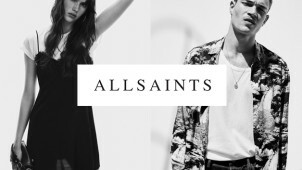 Does AllSaints offer Click & Collect? Currently no, but it is likely to offer the service in the near future. Where can I read about AllSaints’ ethical policy? You can read about how it sources and manufactures products ethically here. Standard Delivery = €9.95 or free for orders over €150. Return your online order to the Distribution Centre within 14 days of receiving your order for a full refund. Exchange or receive a gift card within 28 days. Exchange for different colour or size of the same style. Read the full policy here. Use this Store Finder tool to get opening hours and location info. AllSaints is an edgy, distinctive British fashion brand with global appeal. If you like dark tones and the rock chic look, then you’re in for a treat when you shop at AllSaints. Use an AllSaints discount code and pile your shopping trolley full of apparel for a fraction of the original price. You will find the website brimming with seasonal treasures for men and women, as well as wardrobe staples and statement occasional wear. If you really buy into the AllSaints lifestyle, then you’re going to want to know all the behind-the-scenes stuff as well as the latest campaigns. The Studios pages of the AllSaints website will not disappoint die-hard fans. You can watch ultra cool Films featuring clothes from the latest collections and view intimate Concerts put on by AllSaints in its LA Sessions. Discover the narrative drive behind each season’s collections by checking out the lookbooks. AllSaints may be renowned for its cutting edge approach to textile design, but we’re more into its beautiful collection of Handbags. We dare you to try and resist picking up one or two of these luxury leather pieces of arm candy with a feminine edge! Use an AllSaints voucher at the checkout and keep your bank balance nice and happy. Choose from Totes, Shoulder Bags, Backpacks, Crossbody Bags and a few other styles in earthy hues.